After Porto was selected one of the two cultural capitals of Europe in 2001, the Minister of Culture and the city of Porto founded Porto 2001, an organisation which was to initiate and prepare different urban and cultural interventions for the city of Porto. In this context five international architectural practices, amongst which was OMA, were invited to participate in a restricted competition for a new concert hall to be positioned in the historical centre of Porto, the Rotunda da Boavista. 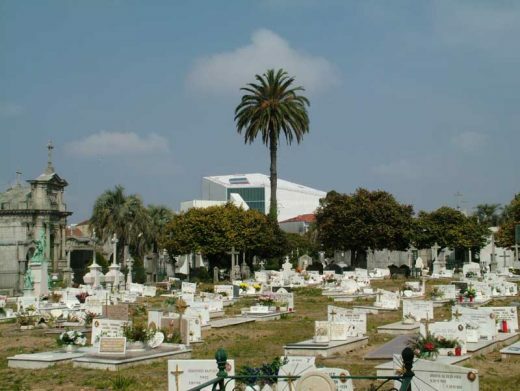 Since this part of Porto was still a city ‘’intact’’, OMA chose not to articulate the new concert hall as a segment of a small scale circular wall around the Rotunda da Boavista but to create a solitary building standing on the new, more intimate square connected to the historical park of the Rotunda da Boavista and enclosed by three urban blocks. With this concept, issues of symbolism, visibility and access were resolved in one gesture. Through both continuity and contrast, the park on the Rotunda da Boavista, after our intervention, is no longer a mere hinge between the old and the new Porto, but it becomes a positive encounter of two different models of the city. This century has seen an architecturally frantic attempt to escape from the tyranny of the notorious ‘’shoe-box’’ shaped concert hall. However, after researching the acoustic quality of existing concert halls we had to conclude together with our acoustic specialist that the best halls in the world have a shoe box shape. Where to innovate in a case of a traditional typology like the concert hall? Most cultural institutions serve only part of a population. A majority knows their exterior shape, only a minority knows what happens inside. OMA addressed the relationship between the Concert Hall and the public inside as well as outside the building by considering the building as a solid mass from which were eliminated the two shoe-box-shaped concert halls and all other public program creating a hollowed out block. The building reveals its contents to the city without being didactic; at the same time the city is exposed to the public inside in a way that has never happened before. The ‘’remaining spaces’’ between the exposed public functions consist of secondary serving spaces such as foyers, a restaurant, terraces, technical spaces and vertical transport. A continuous public route connects all public functions and “remaining spaces” located around the Grand Auditorium by means of stairs, platforms and escalators: the building becomes an architectural adventure. The loop creates the possibility to use the building for festivals with simultaneous performances; the House of Music. 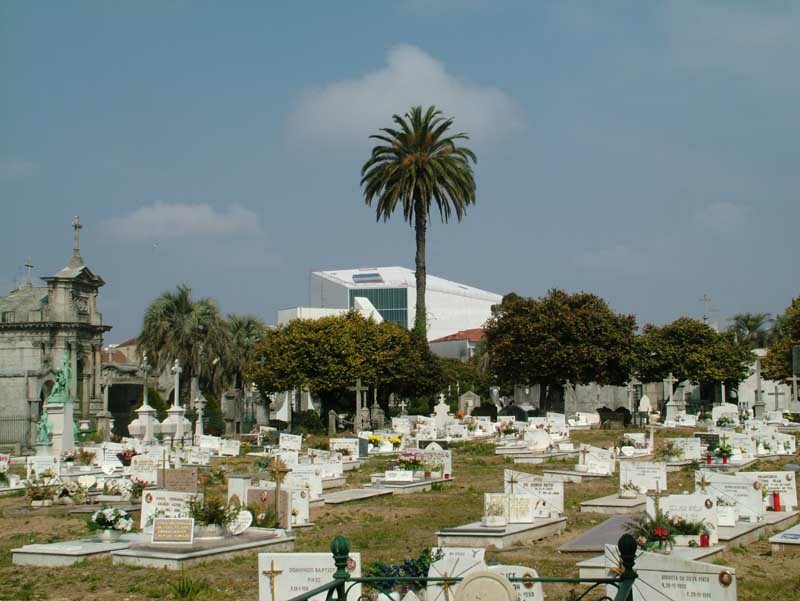 The building provides a large amount of rehearsal rooms, soloist rooms and dressing rooms to house the Porto Philharmonic Orchestra and to provide in addition facilities to external and guest performers. During the Design Phase OMA researched new materials and new applications of existing and Portuguese materials exclusively for Casa da Musica such as; the corrugated glass for the windows of the Auditoria, the used tiles for different rooms and the chairs, canopy and wall finish in the Grand Auditorium. 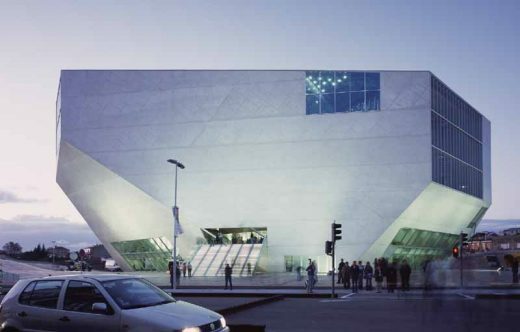 Casa da Musica is visually and spatially defined by its striking faceted exterior from which its conventional interior spaces have been extracted. The buildings 400mm thick faceted shell and the two 1m thick walls of the main auditorium are the buildings primary load carrying and stability system. The auditorium walls act as internal diaphragms tieing the shell together in the longitudinal direction. Arup and OMA researched the concrete mix for external facades. Status: Competition 1999, 1st Prize. Program: Main Building 22.000m2 Grand Auditorium 1.300 seats. Small Auditorium 350 seats, 8 Rehearsal Rooms with recording facilities, Music shop, Cyber and Educational facilities, VIP room, Restaurant and Roof Terrace. Carpark 27.000m2 for 600 cars. Team: Adrianne Fisher, Michelle Howard, Isabel Silva, Nuno Rosado, Robert Choeff, Barbara Wolff, Stephan Griek, Govert Gerritsen, Saskia Simon, Thomas Duda, Christian von der Muelde, Rita Amado, Philip Koenen, Peter Müller, Krystian Keck, Eduarda Lima, Christoff Scholl, Alex de Jong, Alois Zierl, Olaf Hitz, Jorge Toscano, Duarte Santo, Nelson Carvalho, Stefanie Wandinger, Catarina Canas, Shadi Rahbaran, Chris van Duijn, Maria Baptista, André Cardoso, Paulo Costa, Ana Jacinto, Fabienne Louyot, Nicolas Firket, Christina Beaumont.